Abbottsford, despite its closeness to Vancouver, is still very much a little bit of a mystery to me. It’s an area that I haven’t really explored. This municipality is within a short driving distance from the actual city of Vancouver, but since I don’t really drive often, I’ve eschewed exploring the town. And thus I’m grateful that I was invited on the Circle Farm Tours, because I had a chance to sample great businesses. Day 2 was a media tour of the Abbottsford Circle Farm Tours, like the Birchwood Dairy, the Tanglebank Country Gardens, Campbells Gold Honey Farm and Meadery, and the Clayburn Village B&B. The largest of the Samuel Maclure inspired brick houses in Clayburn Village, circa 1906. It includes more clues to Maclure’s hand than do the others. These include shingle work, the roof line, small diamond-shaped window panes, three windows together in the gable end, plus interior detailing, particularly the fireplace. Charles Maclure, the founder of Clayburn, lived here until 1909. One of the most touching stops of our Circle Farm Tour, I think, was the Clayburn Village B&B. We were exhausted after a full day of driving around and a lot of information to take in (thanks Jayne for bearing the brunt of all the driving throughout the Lower Mainland!). I’m really fond of Mom-and-Pop-run, homey bed-and-breakfasts (B&B’s). So when we landed on the footsteps of the Clayburn Village B&B I did have a little bit of an expectation that the owners would be adorable. And they were. Simply amazing. The honest, homey, high-quality and great service approach that the owners of the Clayburn Village B&B take is completely from the heart. We were welcomed with great and warm smiles and given a tour of the bed-and-breakfast. We chose our rooms (and I’ll fully admit I chose the biggest one). I think we all chose as it fit our feeling. 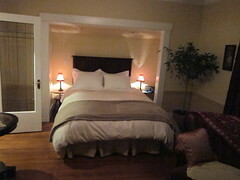 I loved the Orchard Room. You can easily see that the Orchard Room is about the size of my apartment back in Vancouver. So beautiful. The bathroom is walk-in style, and there is a walk-in closet too. 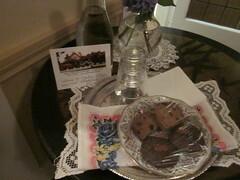 The baked treats upon arrival in each room were an extremely nice and sweet touch. So many details that were key in ensuring our comfort: the iPod dock with alarm clock, the flat-screen TV, and the fan to ensure we wouldn’t be boiling. And the quality of the bedding was out-of-this-world. You can tell that the inn keepers/owners have paid a lot of attention to the service. 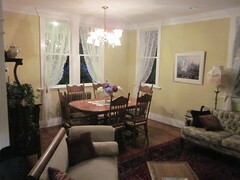 Spacious, stately, second floor room featuring a view to the neighbouring apple orchard. A large, impressive, tiled shower and radiant-heated floors are a step away in your ensuite bathroom. 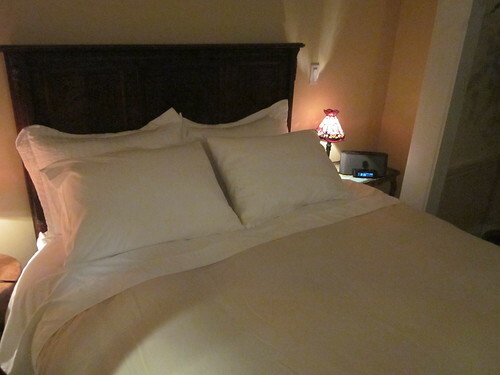 High ceilings and queen-sized bed. Keep current or watch movies with your in-room television. The owners were incredibly disappointed that they were not able to cook breakfast for us (I think, perhaps one of the biggest selling features of Clayburn Village B&B). But they offered us amazing coffee and scones/muffins the next morning, before we departed to Birchwood Dairy. Both Cassandra and I agreed we needed to come back, simply to try the breakfast. Moreover, it was incredibly kind of them to offer us a glass of sherry and sit down with us to share stories about the house (which they fully renovated) and the Clayburn Village overall. 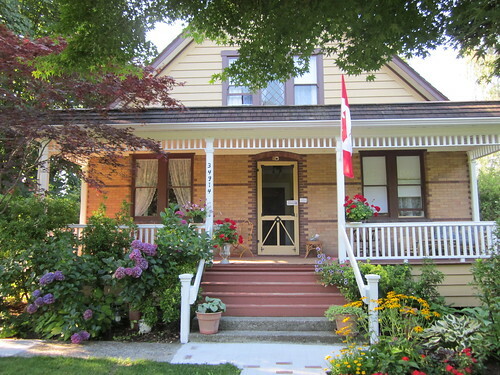 Overall, my experience at Clayburn Village B&B was really great and I look forward to coming back and staying a couple of nights so that I can explore the Clayburn Village area. 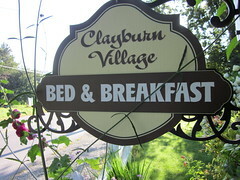 You can contact the Clayburn Village on their website. Disclosure: My stay at Clayburn Village B&B was complimentary as it was one of the stops of a media trip for Circle Farm Tours. You can read all of my Circle Farm Tours coverage here. Breakfast coffee and goodies were compliments of our gracious hosts. Wow, this place looks amazing!! oh, nice!!!! i LOVE B&Bs.